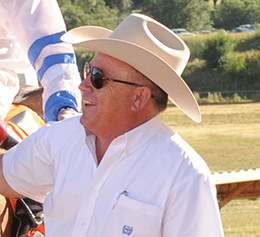 Longtime Quarter Horse trainer John Stinebaugh has filed suit against a compounding pharmacy and drug company supplier over four positive tests from 2013. EL PASO, TX—JULY 14, 2015—Longtime Quarter Horse trainer John Stinebaugh filed a suit last week in El Paso County District Court in Texas against a Texas compounding pharmacy and one of its suppliers for $6 million, alleging negligence in the manufacture of a compounded product used to treat internal bleeding. Stinebaugh was suspended 16 years and fined $40,000 after four of his horses tested positive for the active ingredient in human erectile dysfunction drug Viagra at Ruidoso Downs in New Mexico in 2013. Named as defendants in the suit are Weatherford Compounding Pharmacy in Weatherford, Texas, and its owner, Joe Landers, along with Canada-based Attix Pharmaceuticals and two of Attix’s principals, David Liu and Syveon Liu. The four positive tests for sildenafil came from the Rainbow Futurity and Derby trials contested July 5 and 6, 2013, after veterinarian Boyd Clement treated the Stinebaugh-trained horses with a compounded paste from Weatherford Pharmacy known as “Tourniquet,” a compounded product used to treat internal bleeding. Seldenafil, the active ingredient in Viagra, is a Class 3 drug with Class A penalties under Association of Racing Commissioners International guidelines. According to the suit, Landers had “numerous conversations” with Stinebaugh and Clement prior to the races in question in which he “touted the benefits of the Weatherford Tourniquet Compound Paste and expressly stated that it did not contain any illegal substance or ingredient prohibited by any State Racing Commission.” The product, to be administered 24 to 36 hours before a race, purportedly contained herbal extracts, amino acids and vitamins. Landers “specifically represented” to Stinebaugh and Clement that the product “did not contain any illegal or prohibited ingredient, specifically including Viagra,” the suit claims. The suite alleges that Weatherford and Attix were negligent in their representations and states (Stinebaugh's) “career has been permanently damaged” as a result of the suspension and fine levied against him by the New Mexico Racing Commission. In addition, the suite also claims that due to Stinebaugh's suspension by the American Quarter Horse Association preventing him from training and racing horses in all states (including Texas) he has been caused substantial damages and irreparable damage to his reputation. Additional horses at Prairie Meadows in Iowa around the same time frame in 2013, who were treated from the same batch of Tourniquet Compound Paste, also received positives when they raced. After hearing statements from the drug compounding company and supplier the Iowa commission leveled minor fines against the trainer involved in that case.